A stem cell transplant is when cells are taken out of the blood for use in a transplant. A bone marrow transplant is when stem cells are removed from the bone marrow for transplant. This is when stem cells that are obtained from the bloodstream or umbilical cord of a donor are used for transplant into a patient. Umbilical cord blood stem cells are only used for transplant into children since there are not enough cells present to be of any use for transplant into an adult patient. Before cells can be extracted from the blood various substances have to be introduced, to help trigger the growth of the stem cells. These substances include, for instance, granulocyte- colony-stimulating factor (G-CSF), which is added so that the donors own bone marrow will make and produce more stem cells that will end up in the bloodstream. The G-CSF is added and used to ensure that there will be enough stem cells in the blood for harvesting to be successful. The blood cells are harvested from the blood about 6 days later. The stem cells are then separated from the other blood cells by the process of apheresis, and then they are given to the patient through a catheter placed into a vein. This process can take about 2 hours to complete. Harvesting stem cells from the blood is in many ways an easier process since it does not involve or require the use of anesthesia. Further benefits are that the platelets and neutrophil cells (one of the white blood cells) are more easily able to recover if this method is used compared with the bone marrow procedure. The process is also less painful for the donor since a needle is not being placed into bone. The method also does appear to increases the chances that a graft will be successful. 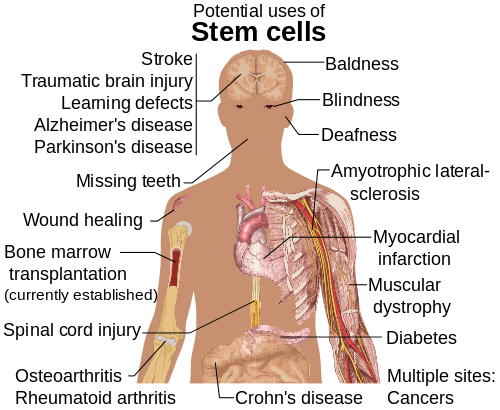 There are some disadvantages to obtaining stem cells from blood rather than from bone marrow. The donor first has to be treated with G-CSF, and then the stem cells can only be harvested a couple of days after the donor since time is needed for the donor’s body to form more stem cells and transport these cells into the bloodstream. Stem cell transplant can be used to treat conditions such as multiple myeloma, and other cancers such as certain kinds of lymphoma and leukemia. The procedure can also be used to replace bone marrow which has been somewhat depleted because of some types of cancer treatments. A bone marrow transplant is when stem cells are removed from a donor’s bone marrow for transplant into a patient. The procedure in which bone marrow is extracted from a donor does require the use of either a local or a general anesthetic. This is necessary because it is a rather painful process in which a needle is inserted directly into the marrow cavity of the bone and stem cells withdrawn. The needle is inserted into the top part of the pubic bones and the cells extracted, with up to a maximum amount of 1500ml taken. The advantage is that granulocyte- colony-stimulating factor (G-CSF) does not have to be given to the donor since the procedure involves going to the source of the stem cells, which is the bone marrow. This also means that the doctor does not have to wait for the G-CSF to take effect. This procedure not only reduces the odds of graft failure but also seems to decrease the chances of developing graft versus host disease, according to research findings. A big disadvantage of this process is the necessity for anesthesia, which, at least in the case of general anesthesia could cause complications. The procedure is also a more painful one than simply removing stem cells from the blood since the needle has to go into bone. Bone marrow transplants are also used in cases where a person has cancers such as some types of lymphomas and leukemias, and multiple myeloma. It can also be used to help patients whose own bone marrow has been destroyed because of cancer treatments. Difference Between Stem Cell Transplant and Bone Marrow Transplant? A stem cell transplant is when stem cells are harvested from the bloodstream or the umbilical cord. A bone marrow transplant is when stem cells are harvested directly from the bone marrow. Stem cell transplants involve cells that are taken out of the blood or umbilical cord. 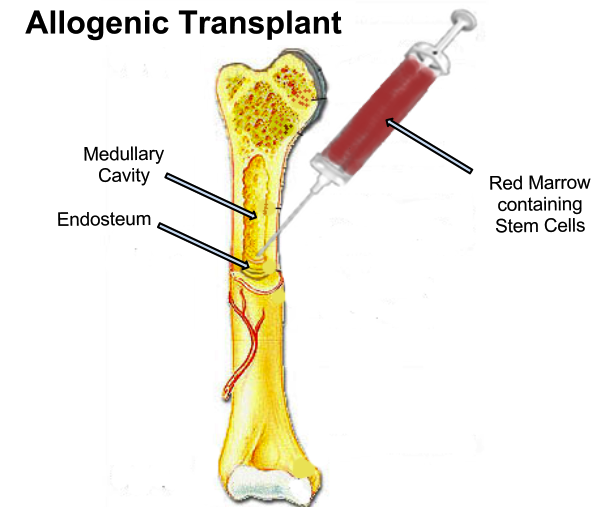 Bone marrow transplants involve cells that are taken out of the bone marrow. In the case of a stem cell transplant, granulocyte- colony-stimulating factor has to be given to the donor a few days before the procedure. In the case of a bone marrow transplant, the granulocyte- colony-stimulating factor is not needed. No anesthesia of any kind needs to be given to a donor when a stem cell transplant is being done. Local or general anesthesia does need to be given to a donor when a bone marrow transplant is being done. There is less pain involved for the donor in a stem cell transplant. There is more pain involved for the donor in a bone marrow transplant. The chance of getting graft versus host disease does not appear to be influenced by a stem cell transplant. The chance of getting graft versus host disease is lessened by a bone marrow transplant. A bone marrow transplant is when cells are taken out of the bone marrow for transplant. Both a stem cell transplant and a bone marrow transplant can be done to treat conditions such as certain types of cancer. A stem cell transplant is a less painful procedure that does not require any anesthesia. A bone marrow transplant has some advantages such as not requiring the use of granulocyte- colony-stimulating factor. Dr. Rae Osborn. 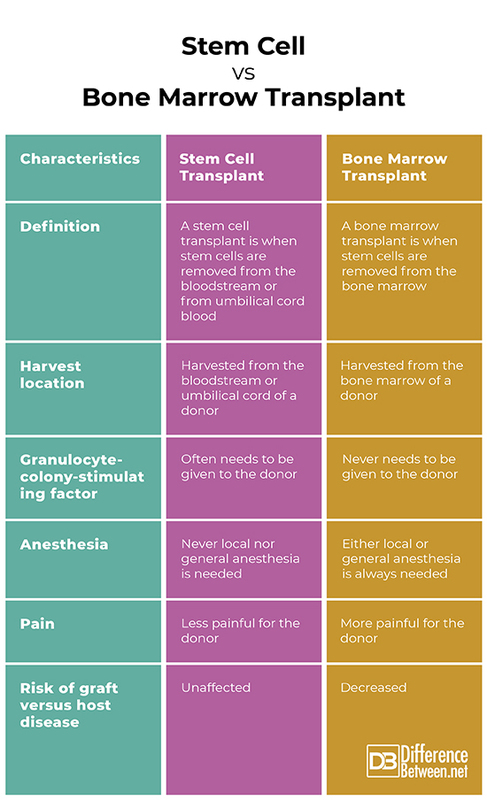 "Difference Between Stem Cell Transplant and Bone Marrow Transplant." DifferenceBetween.net. March 18, 2019 < http://www.differencebetween.net/science/health/difference-between-stem-cell-transplant-and-bone-marrow-transplant/ >. Körbling, Martin, and Paolo Anderlini. "Peripheral blood stem cell versus bone marrow allotransplantation: does the source of hematopoietic stem cells matter?" Blood 98.10 (2001): 2900-2908. Ravinet, Aurélie, et al. "Peripheral Blood Stem Cells Vs Bone Marrow: Stem Cell Source Comparison for Patients Acute Myeloid Leukemia and Myelodysplastic Syndrome Receiving an Allogeneic Stem Cell Transplantation from a 10/10 Matched Donor”. Study from the French Society of Bone Marrow Transplantation and Cell Therapies (SFGM-TC)." (2014): 2552-2552.